It’s an annual event at this stage. Celtic Woman are playing in Kansas City, on Friday, June 26, 2009. The show takes place at the Sprint Center. This show is called “Isle of Hope” as opposed to “The Show” and whatever the other one was called. With unemployment on our green and grey isle now numbering around 12% and rising, in the Republic alone, I imagine the “Hope” refers to hoping for a job or your social welfare to be processed in quicker than 20 weeks. There’s a lot of stuff on the Celtic Woman official site, but for the life of me, using either version, I can’t find where it tells you who’s performing. I do believe that Orla recently left after 4 years and her replacement is Alex, but I think it’s fair to say that - much as I don’t have a whole lot of time for the gloss and the idea of Celtic Woman - you can be sure of top quality singers and top quality musicians. For more about them you can read what I wrote about Celtic Woman before, and more. Tickets are available from TicketMaster, so are probably a steal. 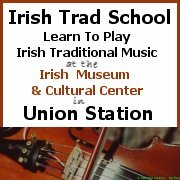 This event is posted on the Kansas City Irish events calendar. This entry was posted on Wednesday, May 6th, 2009 at 6:49 am and is filed under Celtic Woman, Events, Shows. You can follow responses via my RSS 2.0 feed. Both comments and pings are currently closed. Balls. I mean’t June 26th. Yes, it certainly is, thanks Tommy. I have it ok in the post but then listed the wrong date on the calendar. Will fix now. Thanks again.